We host a Mass on the 4th Sunday of each month at 7:30am. We are currently served by Rev. Mark Jones and have merged with St. Matthew Church of the Village of Campbellsport. This year we WILL be having our annual St. Kilian Picnic, set for Sunday, July 17th. Please come and join us! 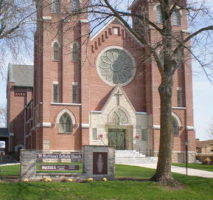 St. Matthew Parish offices are located at 419 Mill Street in Campbellsport.